Compare the latest deals on the OnePlus 6T with our easy to use comparison tool. 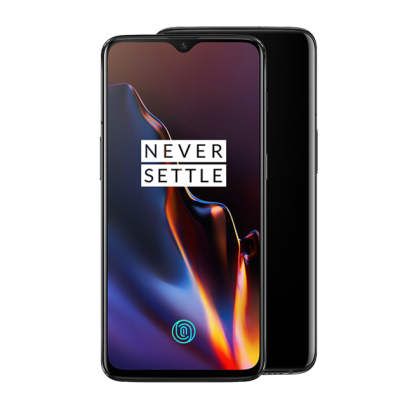 The latest flagship from rebel phone maker OnePlus, this device is a true marvel. Loads of power, a huge screen, great cameras, and all for less than you’d pay for a big name flagship. Could this be the phone that you’ve been looking for? Check out our awesome deals on the OnePlus 6T below! Chinese manufacturer OnePlus have only been around since 2013, but they’ve already made quite a name for themselves. And whilst OnePlus mobiles were once difficult to get your hands on, nowadays they’re far more widely available. Top end specs for lower than average prices is what makes OnePlus stand out from the crowd. But with their last flagship launching a mere six months ago, do we really need an update already? The answer to that is a clear yes, the 6T is a great update and one that brings some much needed new features. Why should you be dying to get one? There’s tons of power, there’s a great camera set, and then there’s that big, bright screen. And you won’t be paying £1000 for it either, unlike other flagship devices. The OnePlus 6T is a fantastic phone with a surprisingly low price tag. The 6T looks an awful lot like other top end phones. It’s a small, slim box with sleek lines and curved corners. It’s a full glass and aluminium build making it light and giving it a premium feel in the hand. And then there’s the screen notch up front, first seen on the iPhone and now a seemingly expected part of a flagship design. It’s a big device though, one that shoppers with smaller hands might have problems with. Under the hood, there are some solid upgrades from older models. You’re getting plenty of power and great performance, you’re getting solid cameras, and you’re getting a huge display. Add in a few extra features and you’re looking at a phone that can go up against the big hitters like Samsung and Apple. Perhaps the most surprising thing here is the price. The 6T doesn’t even come close to the cost of those Samsungs and iPhones, something that’s sure to be a big selling point for a lot of customers. All in all, this is a true top-end phone, and it’s not going to be a purchase that you regret. Performance is the first thing that we look at in top-end phones, and the 6T doesn’t disappoint. You’re getting octa-core processing power here, with a quad-core 2.8 GHz and a quad-core 1.7 GHz processor running simultaneously. You also get either 6 GB of RAM on the 128 GB memory version or a massive 8 GB of RAM on the 256 GB memory version. Either way, you’re getting stunning speeds. This is an Android phone. And it’s one of the first phones to run Android’s new 9.0 Pie update out of the box. This means added speed and stability, as well as some nice new features. Gesture input is better than ever, and battery management is far more efficient with Android 9, giving you more time between charges. Long story short, performance here is excellent. The 6T is fast, responsive, and great at multi-tasking. Even demanding users with CPU intensive tasks should find that the 6T is capable of handling pretty much anything. The display on the 6T is going to be a huge selling point. Literally. You’re getting a full 6.4 inches of screen space here, giving you loads of room for typing and viewing. Beware though, you’re not going to be using this phone one-handed, or slipping it easily into a pocket. Resolution wise we’re looking at 1080 x 2340 pixels, giving you around 402 PPI. That’s not the highest resolution around, but pictures on the 6T look sharp and clear, with no blurring or pixelation. That’s partly thanks to the fact that this is an Optic AMOLED display, which also gives great colour reproduction with bright whites and deep blacks. This is a huge display, and it’s one that’s awesome to look at, despite those slightly low-resolution numbers. From HD video to high-end gaming, the display on the 6T is perfect, and the added size just makes it more of a pleasure to use. Cameras haven’t always been OnePlus’s strong point, but the 6T actually gets a surprisingly good camera set. Up front, you’re seeing a large 16 MP selfie cam (f/2.0 aperture, 1/3.1’’ sensor, 25 mm) meaning excellent pics and great video calling. Around at the rear, there’s a dual lens camera. That’s made up of a 16 MP cam (f/1.7 aperture, 1/2.6’’, 25 mm) and a 20 MP lens (f/1.7 aperture, 1/2.8’’, 25 mm), giving you excellent close-ups and wide shots, as well as solid low lighting photos. And then there’s optical image stabilisation, phase detection autofocus, dual LED flash, and all the other camera features you’d expect to see. We love the cameras on the 6T. Shots are clear, sharp and beautifully rendered, and even the camera software is easy to use. For pros and amateurs alike this camera set should be a dream. There are tons of extra features on the OnePlus 6T and we can’t list them all. But there are a few important things that you should know. Firstly, that fingerprint sensor is now under the screen. That’s right. You just press your finger to the actual screen, meaning no screen space is wasted to fit a sensor in. Second, you’re getting plenty of battery power and the 6T scored highly in our battery life smartphone test for 2019. The 6T gets a large 3700 mAh battery on board that should be more than enough to give you a full day of use. You don’t get wireless charging here, but you do get quick charge tech so you can get a boost of power in a short amount of time. Another thing that the 6T does not have is a headphone jack. You will find a USB-C to headphone converter in your box, but there’s no plugging your cans directly into the phone itself, something that could be a deal breaker for some. The OnePlus 6T comes in two colour versions, midnight blue and mirror black. There’s also two storage versions, either 128 GB with 6 GB of RAM or the larger 256 GB version with 8 GB of RAM. And you’ll need to choose carefully since there’s no SD card slot, you can’t add any extra memory to that. Now, on to what might be the most surprising part for some people, price. Firstly, this is a flagship phone which means many operators will carry it, but it’s OnePlus, not Samsung, meaning some will not. You may need to scan various operators before you find one that sells the 6T. If you’re going SIM-free than you’re looking at paying a mere £499 for the 128 GB version, and £579 for the 256 GB version, a steal when compared to other flagship prices. On contract, you’re looking at around £40 a month or so, with upfront prices going from about £10. As with any flagship phone, contract shoppers should be looking for big data packages. A phone like this with a display that begs for HD video streaming and with a 4G connection you’ll need plenty of data in your package. If you happen to be around WiFi a lot though you might be able to skimp a little on the data and save some cash. Discounts on the phone itself are going to be hard to come by simply because it’s such a new release. We’d expect to start seeing discounts around the second quarter of 2019. In the meantime, if the 6T is a little rich for your blood you might want to check out the regular OnePlus 6 as a cheaper alternative. If you’re looking for a flagship phone but don’t want to pay flagship prices, then the OnePlus 6T is going to be a great option. With all the high-end specs you’d expect, as well as a very affordable price tag, the 6T is a fantastic phone and one that anyone would be proud to own. Everyone likes a bargain, and we’re no exception, which means that in general we love OnePlus phones. And the latest 6T edition is even better than we expected. Obviously we love the power specs and great cameras. But we seriously love a huge display, and the 6T has one of the largest around. All that for a good couple of hundred pounds less than we’d be paying for a bigger name flagship phone? Yes please! The OnePlus 6T is a top end phone that even demanding shoppers will love, but for a very affordable price. What’s not to love about that?